Flip forward to 2013 and there are endless resources that photographers can use to expand their skills and answer their questions. We still have the traditional books and magazines however with the advent of social media there has been an explosion of data availability. You can follow well known photographers like Art Wolfe and Moose Peterson on Facebook and Twitter, you can Google articles and any aspect of nature photography you like. One of my favorite ways to learn, which is often over looked, is to subscribe to nature photography blogs or wildlife photography blogs which will push information to you each and every time the author of the photography blog writes an article. I highly recommend, whether you are a new to wildlife photography or a seasoned veteran, that you subscribe to a few nature photography blogs from photographers whose images inspire you. Most photographers will have information about workshops and tours they offer as that is their bread and butter. This isn’t a bad thing, I’ve taken trips based on those reviews and been very pleased. It can help you weed out the good trips from the bad ones as people often comment within the blog. Many will also share with you valuable shooting tips for a variety of conditions, etc so again it is a great way to learn. Often times the nature photography blog becomes the means by which you, yes little old you, gets to engage in a dialogue with a professional photographer. How cool would it be to open a dialogue with Moose Peterson or Art Wolfe, seriously that’s way cool in my books. Art Wolfe Nature Photography Blog – Art Wolfe is an icon in wildlife and landscape photography as far as I am concerned. In addition to his blog be sure to check out his PBS TV Series entitled “Travels to the Edge” where Art visits hot photography spots. It is his shoe on the Brown Bears of Alaska that was the catalyst for my Brown Bear photography trip this past summer. Andy Rouse Nature Photography Blog – Andy is an award winning photographer out of the UK. His blog offers great tips and a host of tours that you may be interested in taking to capture your own images. COOLWildlife Nature Photography Blog – You knew the shameless plug for my own blog was coming right? What the heck you just might get a tip on a great photography book, a gimbal head review or a shooting tip that’s worked for me so sign up and become linked to my world of wildlife photography. Enjoy the learning and who knows one day you may even be inspired to begin your own nature photography blog and share your experiences with fellow photographers. 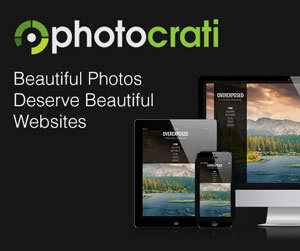 If you ever get to the point where you wish to create your own photography website or start up a wildlife photography blog I highly recommend you review the offering from Photocrati as they offer photography website & blog templates which is what my COOLWildlife site is designed on, it’s very simple to manage and no previous skills are required.